Over 7, 000 people have signed "Let Trump Baby Fly" petition to make sure the mayor allows them to fly the balloon over the Parliament on the day of his visit. Activists in the United Kingdom are ready to send US President Donald Trump flying above London, but not in an aeroplane. 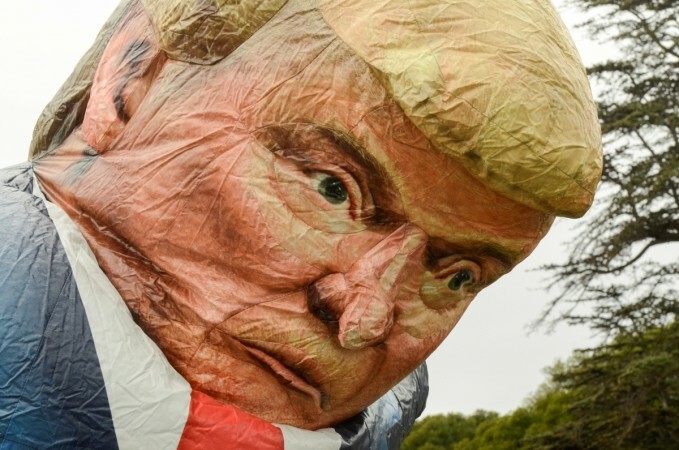 They have planned to inflate a 20-feet tall Trump baby balloon that will soar above the Parliament, symbolising the protest against his visit to London on July 13. The Trump baby balloon will have the president's special blonde hair along with a diaper tied in it. The protest has received support from all over the nation. The campaign has, in fact, raised six times more money than what it aimed at. The group of activists stated that their goal was to raise $2,000 while they have already garnered over $13,000 for the creation of the baby balloon version of the president. The activists are awaiting permission from authorities for flying the balloon above the Parliament and show Trump their response to his Britain trip. They said that if they don't get a permission to fly the balloon above the Parliament, they will make sure it flies over central London. They added that the fund raised through the campaign will not be wasted as they will take the Trump baby balloon on their trips to America. The environmentalist who launched the Trump baby balloon idea said that it's not a protest against the United States but a protest against what "Trump is turning America into." Over 7, 000 people have signed "Let Trump Baby Fly" petition to make sure the mayor allows them to fly the balloon over the Parliament on the day of his visit. "Donald Trump is a big, angry baby with a fragile ego and tiny hands ..." the activists' page stated. "Moral outrage is water off a duck's back to Trump. But he seems to really hate it when people make fun of him. So when [he] visits on July 13th, we want to make sure he knows that all of Britain is looking down on him and laughing at him." The "Trump Baby" balloon protest follows a series of attempts made by different activists who do not want the president to visit the UK. Protests against his visit began as soon as British Prime Minister Theresa May invited Trump to visit the country in early 2017. The UK appears to aim at improving and strengthening its relations with America following its decision to leave the European Union.